Aulacomnium palustre with brood bodies in wet meadow at Waldo, Marion County, Ohio. April 21, 2006. 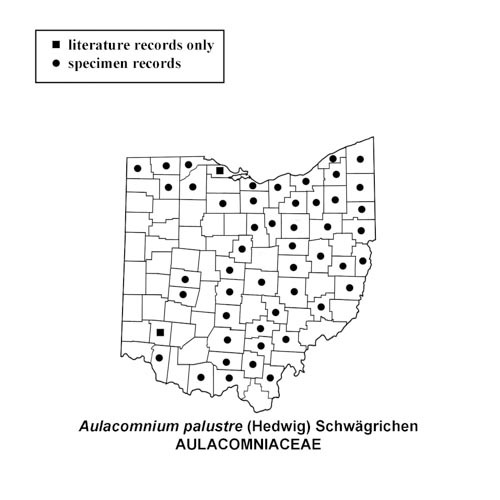 Aulacomnium palustre in wet meadow at Waldo, Marion County, Ohio. April 21, 2006. 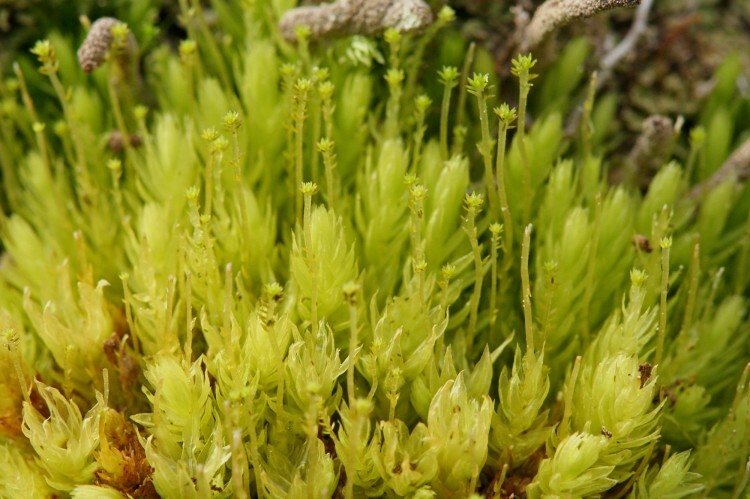 How to recognize ribbed bog moss: Aulacomnium palustre grows in clumps of erect plants with brownish tomentum (thick growth of rhizoids on stems) along the lower part of the stems. It is often found with a thin stem extension growing up from the leaves with tiny leaf-like clusters of gemmae (brood bodies) at the top, and a few scattered along the stem extension; these brood bodies are the asexual beginnings of new plants. 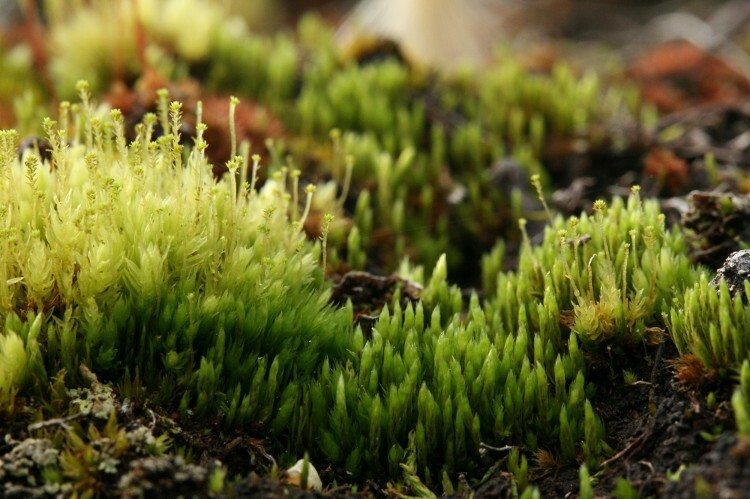 Sometimes the plants are found with only a naked stem extension with the gemmae mostly dispersed, and occasionally with sporophytes with curved capsules. When wet the leaves give the plants a somewhat bushy appearance; when dry the leaves shrivel and contort. Under the microscope the single costa extends almost to the serrulate leaf tip, and the leaf margins are revolute (bent towards the back of the leaf). 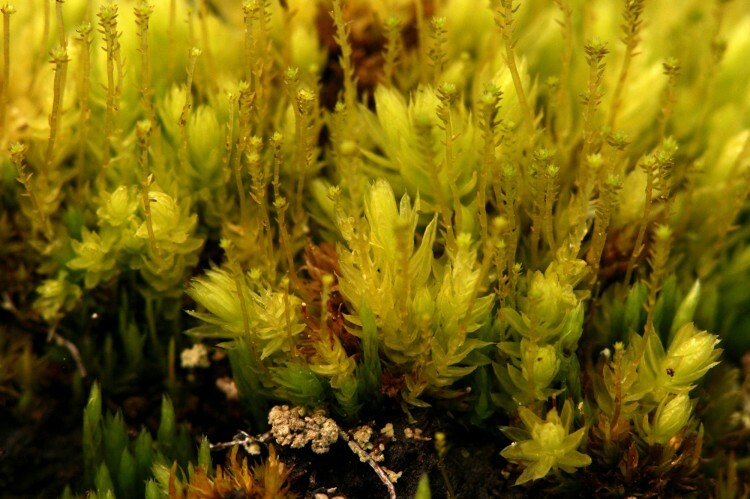 Where to find ribbed bog moss: Aulacomnium palustre is found in wetlands from bogs and fens to swamps and marshes.